A trip to my maternal grandparents’ home on festivals has always been a promise for some amazing Old Delhi food. In the mid 1950s, my mother’s parents moved to the migrant colony of Lajpat Nagar in Delhi from Ludhiana in Punjab, with scores of Multanis as their neighbours. With my grandparents’ roots in Punjab and Old Delhi’s Chandni Chowk respectively, my mother and her siblings ricocheted between some very traditional UP style food and the decadence of Punjabi cuisine. What they grew up eating is what I describe as quintessentially Delhi food! After both my maternal grandparents passed, their culinary traditions have been carried forward by their children and their spouses and now my generation. Whenever we meet for festivals like Rakhi or Bhai dooj for elaborate brunches, my Mami (my maternal uncle’s wife) would already keep the dough ready for a Chandni Chowk style bedmi to be served with the side of aloo sabzi, Punjabi Chhole and Dahi bhalle amongst other things. Bedmi or Berhmi is a variation of the Poori, a fried whole wheat bread. 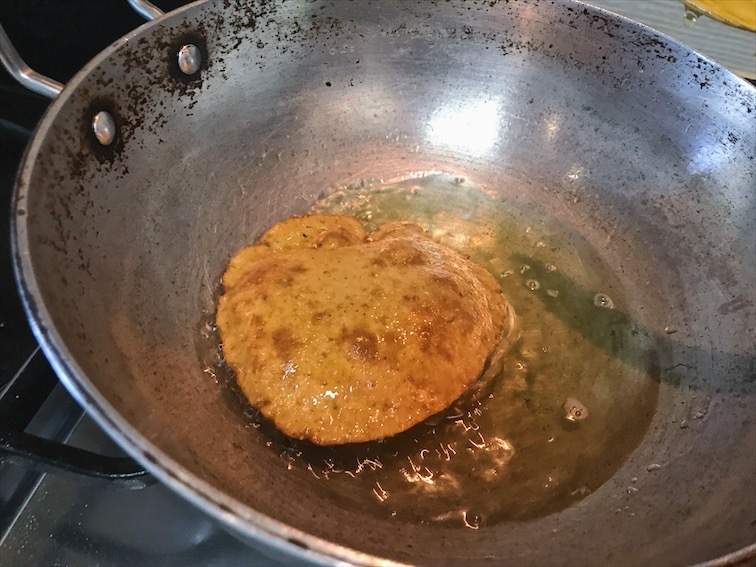 The frying process makes a poori puff up and if you cook it well enough, it develops a nice crust that we as kids loved breaking and eating. The good thing about the Bedmis was that the crust was even crunchier thanks to the use of Urad dal. 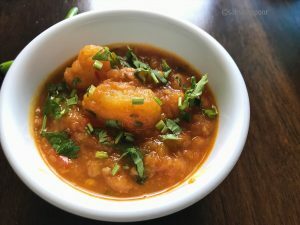 Bedmi is traditionally served with a side of a spicy and flavourful tomato based Aloo (Potato) sabzi that’s acidic enough to balance the oil in the Bedmi or poori. There is another accompaniment that is popular with this duo in the streets of Old Delhi. A tangy and spicy methi chutney forms an interesting ménage a trios with this Bedmi Aloo situation! 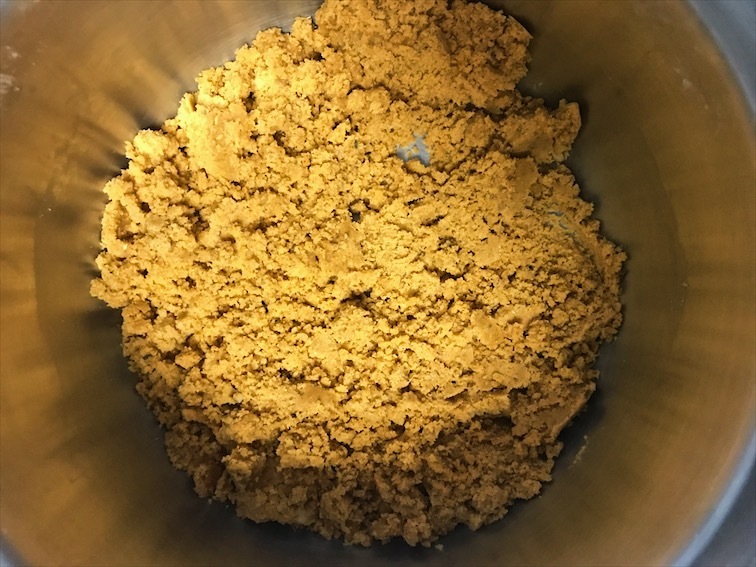 Soaked Fenugreek or methi seeds are cooked with dried raw mango and other spices and condiments like asafoetida added to a chutney that aids with digestion. But we’ll talk about that recipe on another occasion! I won’t deny that this is a calorie rich meal and that is the reason that we have this only on special occasions like festive brunches. Not just that, but this is a slightly more elaborate meal and is great for a weekend cooking plan. Now this may intimidate some, but it comes together like clockwork when my mom is in the kitchen. On weekends when we all fail to impress her with our suggestions of what we want for brunch, she declares that Poori Aloo is what we’ll have! Maybe she wants to be unimpressed on purpose, so that she herself can relive the food memories of her own childhood. Wash the potatoes in tap water to clear them of any dirt and debris. Once washed, place them in a pressure cooker with a teaspoon of salt and cover them with room temperature water. Shut and place the pressure cooker on medium high heat. Till the first whistle comes, start working on the bedmi dough. Cook these potatoes to only one whistle and not more. As soon as the first whistle comes, switch off the heat and wait for the pressure to release on its own. Start by measuring the Aata and the urad dal. 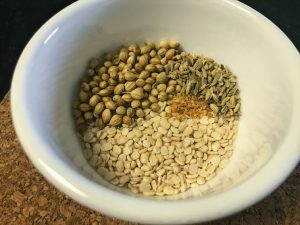 In a coffee or spice grinder, grind the urad dal, coriander seeds and fennel seeds together to a coarse powder. Time to wash and dry your hands because you’ll be handling the dough now! In a big paraat (which is an Indian wide plate with raised edges) or a big deep bowl, mix the urad dal and spice powder with the aata. Add salt, red chilli powder and heeng. Mix all this roughly and then start adding the oil little by little and start working the mixture with your hands to make a crumble. 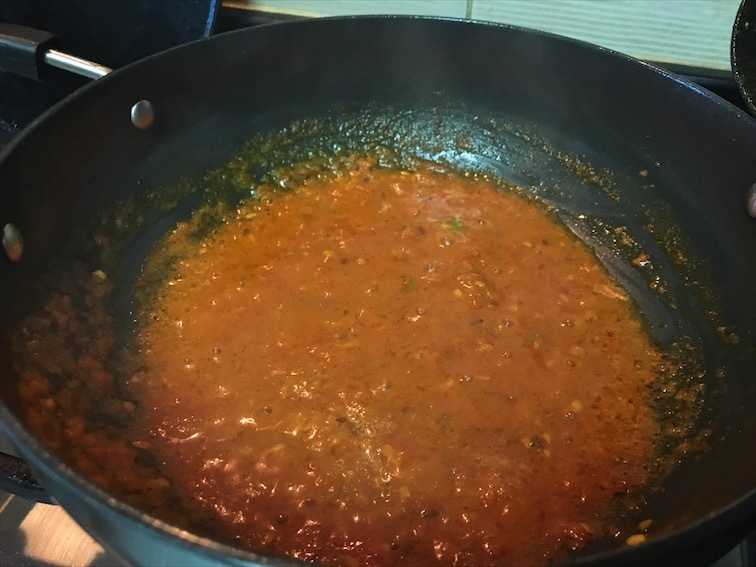 Rub the dal and atta together with the oil to mix them well. Then start adding a little bit of water to make the dough. Remember that for pooris and bedmis, the dough has to be a little hard. It cannot be pillowy soft like the dough for rotis. So be careful while adding the water and add the water gradually. The water can be at room temperature. Knead the dough to make a stiff ball. 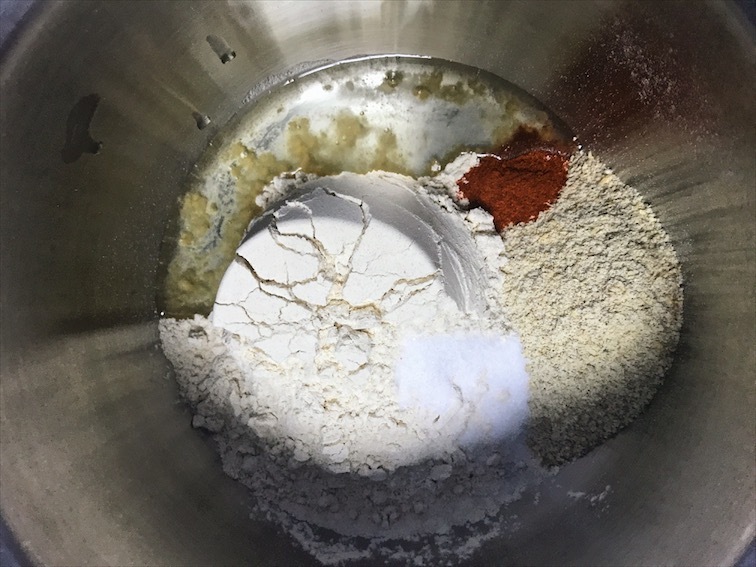 Incase you do add excess water, you can rescue the dough by adding a teaspoon or two of semolina and knead it a bit more. Once the dough has been kneaded, cover the vessel with a damp cheese cloth and keep aside. Till the dough rests and the pressure from the cooker releases, we will start our prep for the aloo sabzi. Wash 3 large tomatoes, ginger and the green chilli. In a food processor, place roughy chopped tomatoes, ginger and green chilli and pulse them together to make a purée. Gather cumin seeds, fennel seeds, fenugreek seeds and asafoetida in a small bowl. In a big pan or a kadhai, pour 2 tablespoons of cooking oil and heat on medium high heat. Once the oil heats up (in 1-2 minutes), thrown in the whole spices and heeng in and let them bloom for a minute. Next, add the tomato ginger chilli purée in the kadhai and stir in. Be careful of the splashes and spluttering. 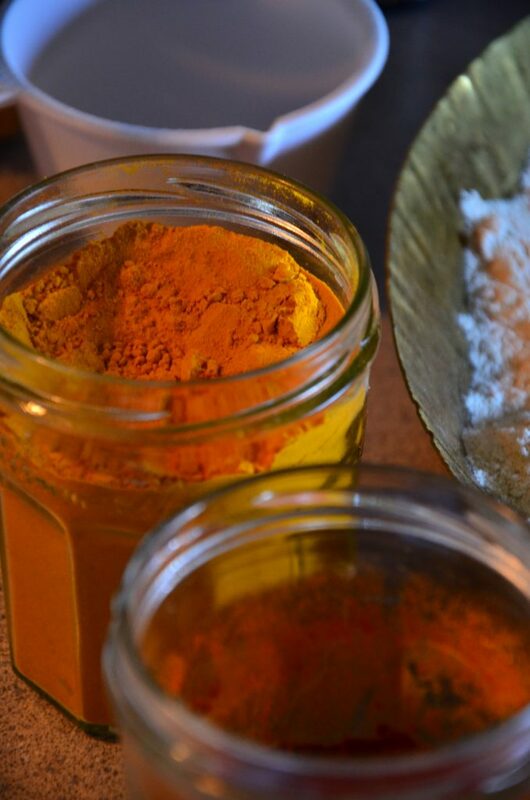 Add salt, coriander powder, red chilli powder, turmeric powder and garam masala and mix it all in. Reduce the heat to medium low and let the tomatoes cook for a while. Now take out the boiled potatoes from the cooker as they would have cooled a bit by now. Peel the potatoes and break them into pieces. you can also cut them with a knife. Breaking them into uneven pieces makes the smaller pieces mix in the curry to eventually thicken it. Back in the kadhai, once you see the oil separating on the sides, add the potatoes and mix to coat them. You can put in some Launji masala or Amchur (Dry Raw mango powder) for sourness at this moment. This is optional since the tomato also lend sourness to the curry. 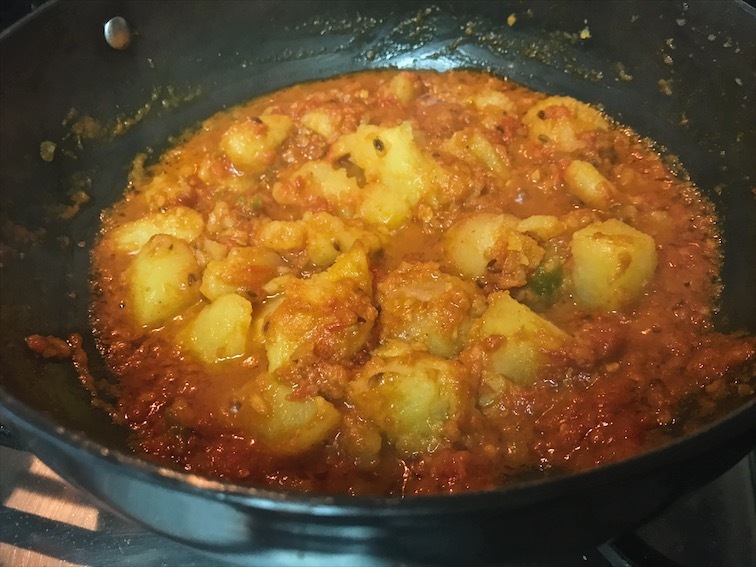 Cook the potatoes in the tomato for 5 minutes and then add a cup (or less) of water and adjust the consistency of the curry. If you like it watery you can add a bit more water. Let this simmer on low heat till you see the oil separating again. Now we move on to making the bedmis. Place a dry heavy bottomed kadhai on medium high heat and pour a cup or more of cooking oil for deep frying. 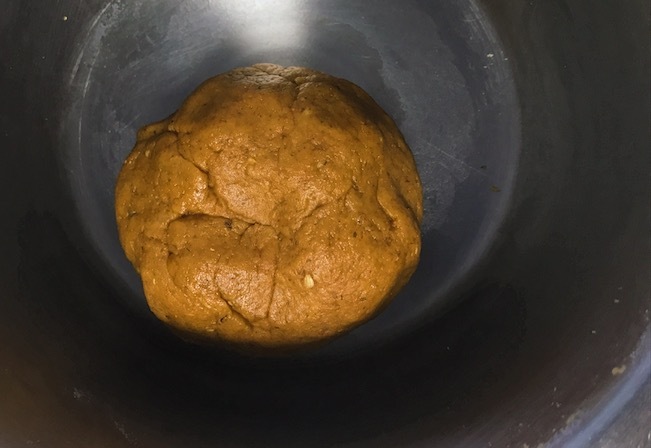 Take a small amount of dough and make a lemon sized ball by working it between your palms. Tip: When rolling dough for pooris or bedmis or kachoris, you will need to use a few drops of oil to prevent it from sticking on the chakla or the counter. 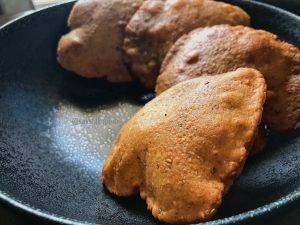 Do not use dry flour as that will just burn in the oil and stick to your poori/bedmi. Now using a few drops of oil, flatten the dough ball to make a small round. It should neither be too thick or too thin. 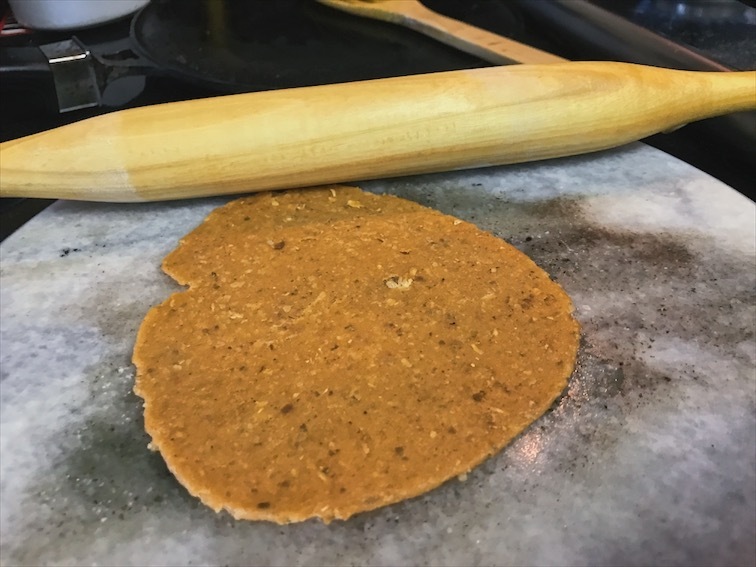 Before placing this rolled out bedmi in the oil, prepare a a coin sized flattened dough piece and place it in the oil to test if it’s hot enough. If the dough sinks then it is still cold and you should wait for the oil to heat up more. If the dough rises and starts to change colour then it’s hot enough. Once the oil has been tested, place the rolled out bedmi in the oil carefully and wait for it to cook on one side. Turn it with a skimmer and take it out of the oil once it turns golden. Drain it on a kitchen paper towel. Check the Aloo sabzi for oil on the top or sides. Once it boils and is the right consistency, take off the heat and garnish with chopped coriander. Serve the Aloo sabzi with hot puffy bedmis and a pickle or chutney of your choice! An old Delhi brunch is served! 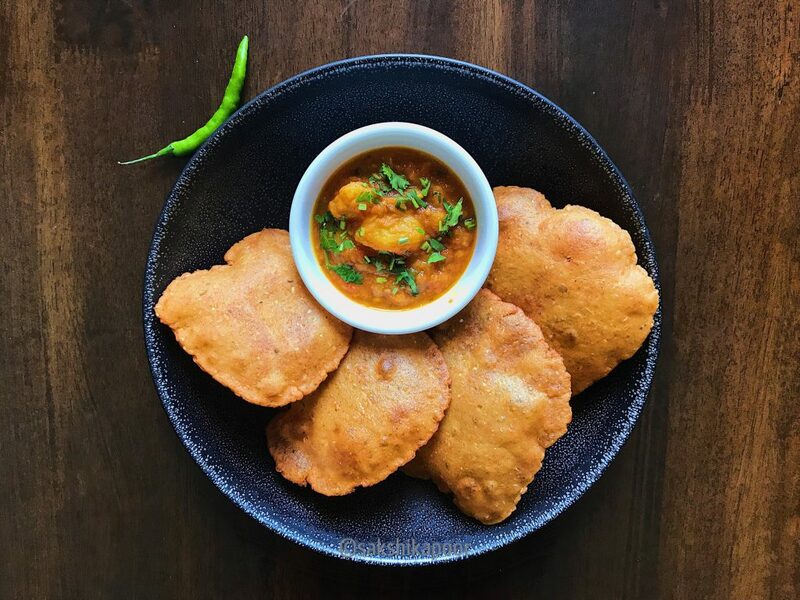 A typically Old Delhi style brunch with crispy or khasta bedmi pooris paired with a tangy and rich tomato based Aloo sabzi. When rolling dough for pooris or bedmis or kachoris, you will need to use a few drops of oil to prevent it from sticking on the chakla or the counter. Do not use dry flour as that will just burn in the oil and stick to your poori/bedmi.